Could crayfish replace lobster as the red-shelled delicacy of choice for late-summer crustacean sucking? For Swedes, there has never been any question. Who knew? Well Ikea for one, of course. Crayfish feasts became an annual August tradition in Sweden when restrictions were placed on crayfish harvesting to prevent over fishing thus creating a season (think Oktoberfest with crustaceans). And guess what? It’s harvest time! How to celebrate? Apparently whether you're a furniture store or a restaurant, the answer is to host a feast. The official website of Sweden recommends eating them outdoors while wearing bibs and, we quote, “comic paper hats” and “sucking noisily to extract the juices.” But if you are shy about doing this in front of your apartment building for fear of being institutionalized, there are a couple places in the city where Vikings will boil the little buggers for you. Aquavit in midtown is offering a $25 “crayfish peel and eat” special through Sunday, which includes one pound of the delicacies along with garlic bread, boiled potatoes and Jarlsberg cheese. Or, coordinate your fall decorating with shell shucking at Ikea. That's right! 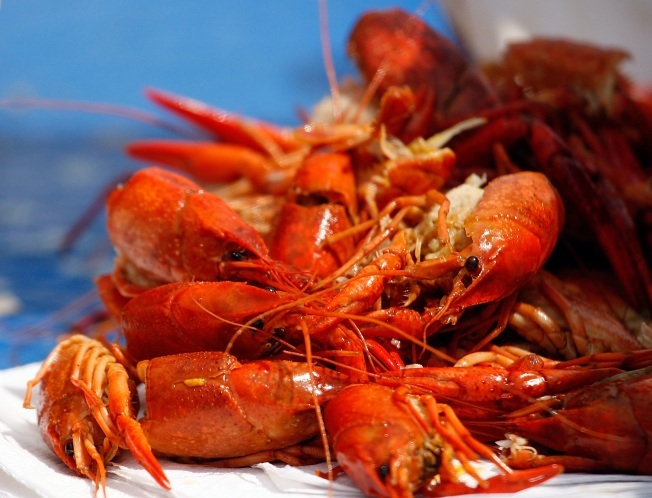 America’s go-to for all things Swedish is hosting an all-you-can-eat “crayfish epicurean extravaganza” for just $9.99 at the Red Hook location on August 21. How many places can you get an authentic epicurean extravaganza and sensibly priced shelving all in the same place? The smörgasborg includes cheese, meatballs and mashed potatoes, along with a “how many crayfish can you eat before your cardboard furniture gets here? !” competition. There is also restaurant in the West Village called Smörgas Chef, but don't bother calling there about any crayfish spectacular. They are Norwegian and clearly party poopers.